In a review article in this issue (pp. 511-538), Kaneko-Ishino and Ishino discuss the concept of LTR retrotransposon-derived acquired genes in mammals and the contribution of these genes to mammalian evolution. They have been investigating the complex issue of mammalian development and evolution in a cooperative way through the novel genomic imprinting studies they have performed since 1990. They have accomplished several outstanding achievements in this field. Among them, their reports in 2006 and 2008 on the two paternally expressed imprinted genes, Peg10 and Peg11/Rtl1, were epoch-making in terms of mammalian biology. 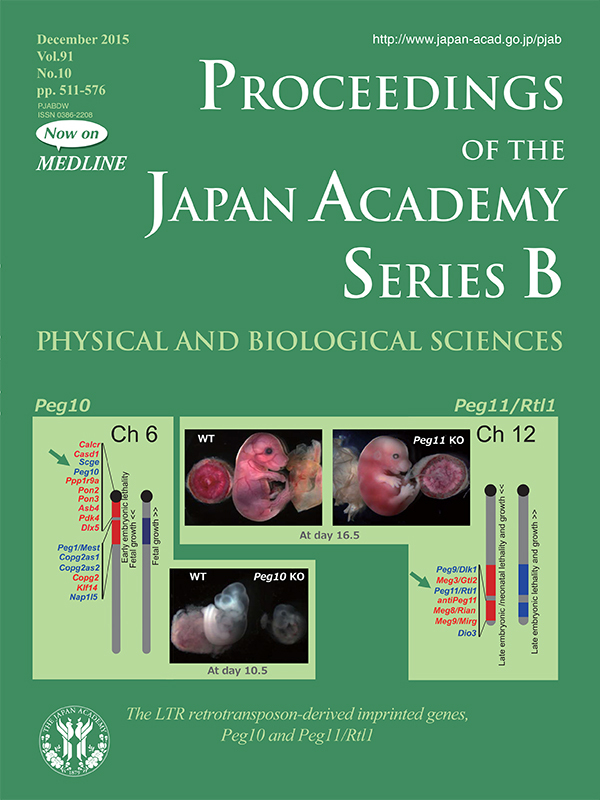 Peg10 KO mice exhibit early embryonic lethality due to sever placental defects (left), demonstrating that Peg10 plays an essential role in mammalian development via the formation of the placenta, an organ specific to viviparous eutherian mammals, and is the gene responsible for the early embryonic lethality observed in the maternal duplication of mouse proximal chromosome 6. Peg11/Rtl1 KO mice exhibit late embryonic/neonatal lethality due to breakage of the fetal capillaries in the placenta (right), demonstrating that Peg11/Rtl1 is essential for the maintenance of the placenta and is responsible for the phenotypes caused by the maternal duplication of the mouse distal chromosome 12. Unexpectedly, both of these genes are derived from an LTR retrotransposon, a component of the mammalian genome that was essentially ignored at that time. Their work has broken new ground in terms of understanding of the role of retroelements in the genome as well as that of the placenta in the evolution of viviparity in mammals. 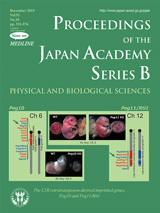 In this regard, it represents not only a turning point in their ongoing investigation from genomic imprinting (mammalian-specific epigenetics) to retroelement-derived, acquired genes in mammals (mammalian-specific genetics), but also in developmental and evolutionary mammalian biology itself. Their work provides a very powerful research protocol for investigating mammalian-specific traits by combining comparative genomic searches on mammalian-specific genes from LTR retrotransposons with genetic analyses of their biological functions using KO mouse technology. The effectiveness of this approach has been demonstrated by their subsequent elegant investigation of Sirh7/Ldoc1 and it has been further expanded to brain function, as shown by their recent reports on Sirh11/Zcchc16.